Theater in the Now: Review: Who's Afraid of the Big Bad Wolf? Review: Who's Afraid of the Big Bad Wolf? If metaphors are your thing, Adam Rapp’s latest gritty drama is right up your alley. 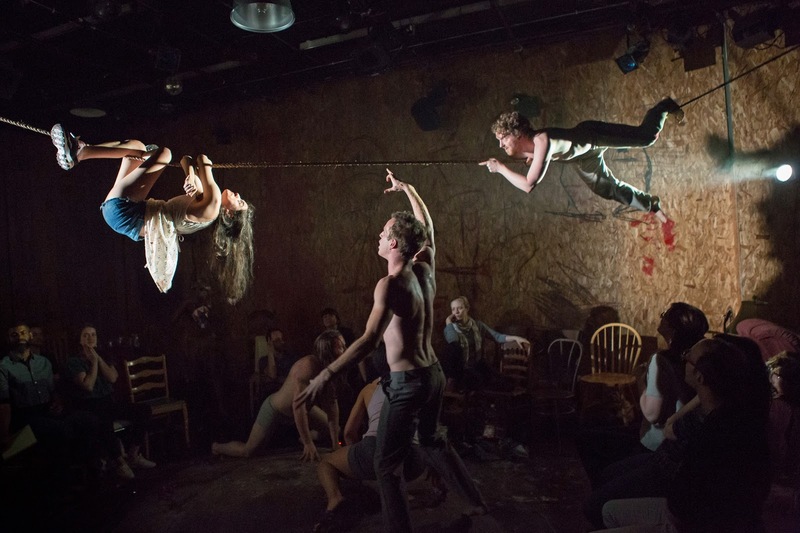 Presented by The Flea Theater, Wolf in the River follows a cannibalistic tribe of youngsters in a poverty-stricken sector of America where a girl with a glimmer of optimism dreams of getting out. Filled with lyrical grime and primal carnage, Wolf in the River is a twisted fairy tale like you’ve never seen before. Engulfed in a world of pure trauma, Wolf in the River is an ambitious and bombastic study of humanity through the lens of a shape-shifting metaphor of a beast who shares the story of Tana, a 16-year-old girl who lives in an impoverished part of the country where tribe leader Monty reigns supreme, literally controlling the minds and blood that flows from her arranged clan. Also within the clan are Tana’s discharged army brother Dothan, who happens to be Monty’s beau, Aiken, the alpha girl of the group, and Pin, Tana’s dim savior. Told through a series of jarring and shuddering scenes and songs, Wolf in the River has shock value on point. Rapp’s text is distorted poetry. There is an attention to detail in his words. And if you truly listen, his story is unsettling. And that is the point. But if you’re looking for a clear character journey, Rapp seems to focus on Tana while leaving the others to drown in the river. That being said, what Rapp explored with Tana was nothing short of stunning. The character he, and actress Kate Thulin, was not only courageous but remarkable. While it was a bit of a juxtaposing moment of the piece, Rapp’s shining moment was the meet-cute between Tana and her dream boy Debo. Perhaps that was due to the fact that it lacked fear, though love is terrifying in its own right. Rapp’s offering including tantalizing monologues, a harrowing siren chorus, and what can only be described as a random Miley Cyrus music video, but when Rapp allowed the audience to tempt fate, something seemed to change. It felt like a cop out. The play begins with The Man describing the clothing remains of who we’ll later learn is Tana. But when Tana’s fate is about to be revealed in the narrative, the black and white rocks from “Survivor” make a cameo allowing one lucky audience member to choose which path Tana takes. Until this point, Rapp was describing a world in which the people have no path to choose and suddenly, we get an option. It was a bit strange to suddenly move in this direction. Wolf in the River requires a group of actors eager to rise to the occasion and tap into fear. And this was a ferocious company. As Tana, Kate Thulin gave a star-defining performance. Thulin’s transformation into the young girl was enchanted. Thulin was engrossed in an emotional journey. She eased into the world of fear through her characterization. Thulin’s susceptibility on stage was phenomenal. To play the Southern-fried storyteller, Jack Ellis bared all. Like Thulin, Ellis’ characterization was impeccable. He offered a tenacious allure to The Man. At first glance, Xanthe Paige doesn’t appear as a natural ruler but her persistency and supremacy defied facade. While we don’t quite know the etymology of Monty’s obsession with Miley Cyrus, Paige’s show-stopping dance-n-twerk routine was unforgettable. And Paige certainly was able to rock the crocodile pimp cane. Maki Borden as Debo served as much needed comic lightheartedness. He played well off of Thulin’s Tana. While they didn’t get as much acclaim as the other characters, William Apps, Karen Eilbacher, and Mike Swift as Dothan, Aikin, and Pin respectively brought variety to Rapp’s piece. While they did play occasionally important parts in the narrative, the six set Lost Choir thrived at spooking the audience vocally and popping out when you’re least expecting it. Adam Rapp succeeded in the sense that he was easily able to create a room full of fear within The Flea. From the start, there is an instant element of discomfort. There is tension as the ensemble meanders about on stage as you sit in the mismatched chairs that surround the toy graveyard that is the pile of dirt in the middle of the stage. With a theater in the round set up designed hauntingly by Arnulfo Maldonado, Rapp used the mound as he primary playing space. With tight rows of audience forming the circle, there was opportunity to have some action occur behind the audience. The problem with this conceit is that every seat has its own series of pros and cons. If you’re sitting right next to the refrigerator where the door opens, chances are you can’t see within. Was it essential to see inside? Who knows but if that person misses the action there, others across the room will miss other key moments like The Man in the recliner or Pin assembling the raft. Oh and be aware, the lights are tight but you will be seen by the rest of your neighbors. Your reactions will be clocked in by someone who can see you. Staging aside, Rapp was able to contrive a theatrical event where it left you eager to see what comes next because it was beyond your wildest dreams. With theatricality on her side, Masha Tsimring proved a striking display of lights. The tattered costumes from Michael Hili and Hallie Elizabeth Newton looked stunning but had a dystopian feel that placed them outside the world of the play. Wolf in the River is unlike anything you’ve ever seen. It will catch your breath and keep you on edge. What’s unfortunate is that the environment in which Rapp placed his audience elevated the experience, potentially distracting from the content presented. There were troublesome components to the text but when you’re thrust in a space such as this, the elements will get the better of you and sway the experience into something extraordinary. It’s when you have more time to think about the play that you’ll really start to question Wolf in the River. For good and for bad.